To claim this profile, please confirm you are Alyssa Beviaqcua. To follow this profile, please let us know your relationship to Alyssa Beviaqcua. RESULTLoss Girls varsity basketball vs. Rain. The Gulf Shores varsity basketball team lost Monday's neutral playoff game against Rain (Mobile, AL) by a score of 51-41. This game is part of the "2019 AHSAA Girls Basketball State Championship - Class 6A" tournament. RESULTWin Girls varsity basketball vs. Daphne. The Gulf Shores varsity basketball team won Wednesday's neutral conference game against Daphne (AL) by a score of 38-35. RESULTWin Girls varsity basketball @ CHCA. The Gulf Shores varsity basketball team won Friday's away non-conference game against Cottage Hill Christian Academy (Mobile, AL) by a score of 59-27. RESULTLoss Girls varsity basketball vs. Foley. The Gulf Shores varsity basketball team lost Tuesday's home non-conference game against Foley (AL) by a score of 52-34. RESULTLoss Girls varsity basketball @ Spanish Fort. The Gulf Shores varsity basketball team lost Monday's away conference game against rival school Spanish Fort (AL) by a score of 48-38. RESULTWin Girls varsity basketball vs. Robertsdale. The Gulf Shores varsity basketball team won Friday's home conference game against Robertsdale (AL) by a score of 30-29. RESULTLoss Girls varsity basketball @ Daphne. The Gulf Shores varsity basketball team lost Tuesday's away conference game against Daphne (AL) by a score of 43-27. 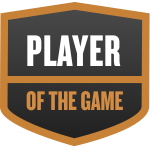 Alyssa was selected the Player of the Game in the basketball game against Fairhope on Fri, Jan 11 2019. Congratulations to #10 Alyssa Beviaqcua for being selected the Gulf Shores Girls Basketball Player of the Game. Alyssa's basketball stats have been updated for the win @ Bayside Academy. RESULTWin Girls varsity basketball @ Bayside Academy. The Gulf Shores varsity basketball team won Friday's away non-conference game against Bayside Academy (Daphne, AL) by a score of 53-24. Alyssa's basketball stats have been updated for the win vs. Spanish Fort. RESULTWin Girls varsity basketball vs. Spanish Fort. The Gulf Shores varsity basketball team won Tuesday's home conference game against rival school Spanish Fort (AL) by a score of 53-16. Alyssa's basketball stats have been updated for the loss vs. Fairhope. RESULTLoss Girls varsity basketball vs. Fairhope. The Gulf Shores varsity basketball team lost Friday's home non-conference game against Fairhope (AL) by a score of 39-29. Alyssa's basketball stats have been updated for the win vs. St. Michael Catholic. RESULTWin Girls varsity basketball vs. St. Michael Catholic. The Gulf Shores varsity basketball team won Thursday's home non-conference game against St. Michael Catholic (Fairhope, AL) by a score of 44-30. Alyssa was selected the Player of the Game in the basketball game against Daphne on Thu, Jan 03 2019. Alyssa's basketball stats have been updated for the win @ Robertsdale. RESULTWin Girls varsity basketball @ Robertsdale. The Gulf Shores varsity basketball team won Tuesday's away conference game against Robertsdale (AL) by a score of 46-39.